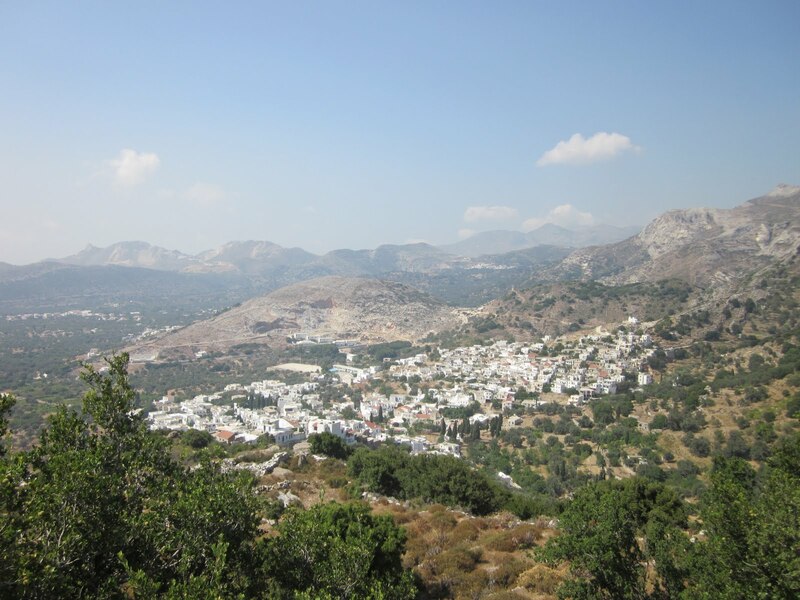 I'm writing from Naxos, a beautiful island in the Cyclades. I haven't seen many Greek islands, but so far Naxos is probably my favorite. It is a big island that has its own economy separate from the tourist trade, so while there are plenty of tourist-oriented shops, tours, and sights, it feels like there's more going on here than just catering to summer visitors. 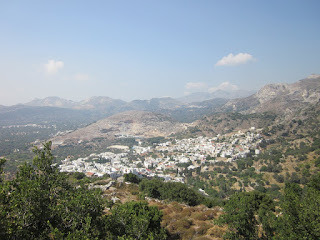 View from an ATV riding around Naxos! 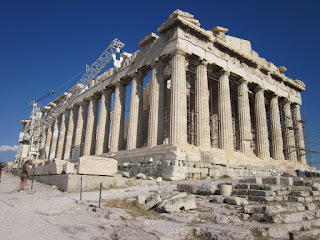 In the other two cities we've visited so far, Athens and Chania, there are very clear tourist areas. 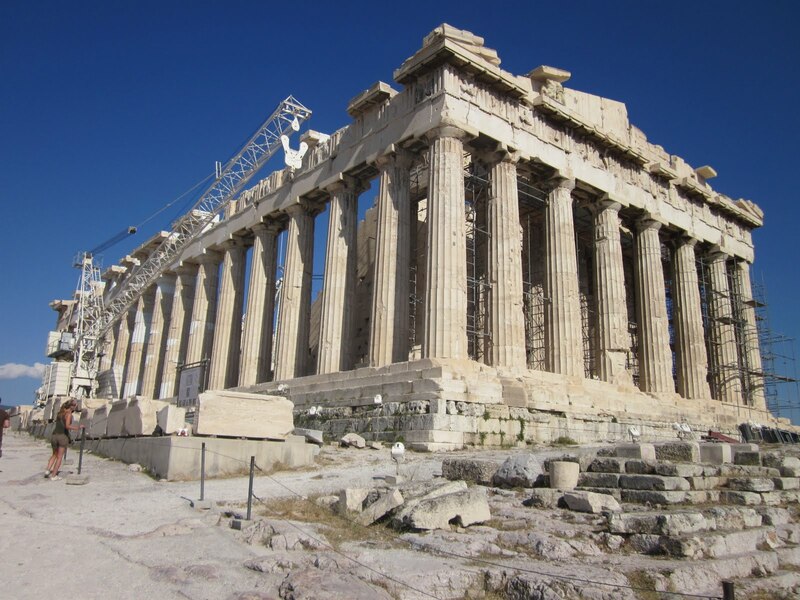 The Plaka in Athens is a mix of streets full of shops, restaurants, bars, gyro stands, and occasional ruins. (There is also an incredible baklava place that sells Nutella baklava - oh man, it's good.) Chania's old city has narrow alleys that lead between gorgeous homes and ruins from both the destruction of the Minoan civilization and World War II bombings. In both cities, the history is present and mingled into the everyday landscape. Naxos does have significant history - I'm not sure how many centuries it goes back, but quite a few - but as you wander through the old market and the old city, you easily find yourself stumbling into residential areas, churches that are still in use, and signs that are only in Greek. There are definitely more touristy areas, but they blend quickly into the everyday physical landscape. This isn't always true, but I've noticed some interesting bathroom trends in the few times I've been to Europe. Often, showers do not come with tubs. I don't mean that it's annoying not to be able to take a bath - I mean that there is no tub rim to keep the water from flooding the rest of the bathroom. Bathrooms frequently have drains in the center, but tubs seem to make a little more sense. Also, shower curtains are optional here, which has caused me to soak my clothes or towel on more than one occasion. I like a lot of things about European hostels and hotels, but I do love my American showers. What's that? You made a vase in art class with your bare hands? Yeah, I guess that's cool, too. This past weekend, I went back to visit my family and friends around Boston. It was just a short visit, but I got to eat my mom's cooking, spend time with a couple friends, and visit two of my three favorite ice cream places around Lexington. Here are some photos from the weekend! This is the view from Megabus on my way into the city. You can see the Prudential Center, the John Hancock Building, and the Citgo sign by Fenway Park. This is why I always try for the window seat. At the beginning of the summer, I wrote a post about my favorite ice cream spots in Lexington and the surrounding towns. Happily, on my first night in town I went to Bedford Farm's with a friend to get the flavor burst soft serve that I love. This is the bubble gum flavor burst - it's so pink and pretty! Here's Boston Harbor. My friend Hope and I walked around the waterfront in the North End for a bit before attending a free wine tasting at the Golden Goose Market. There was a little girl at the wine tasting with an adorable puppy. When we went over to pet it, Hope tried to make conversation with the girl. She asked, "Is your dog a boy or a girl?" 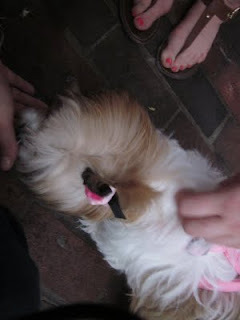 to which the little girl replied, "Well, she's wearing a pink ribbon." Hope and I did not impress that girl with our smarts, apparently. This is one of my favorite views of the city, from the Charles/MGH T stop on the Red Line. When heading inbound, you pull out of the Kendall T stop and suddenly you see this. It's beautiful even on rainy days. 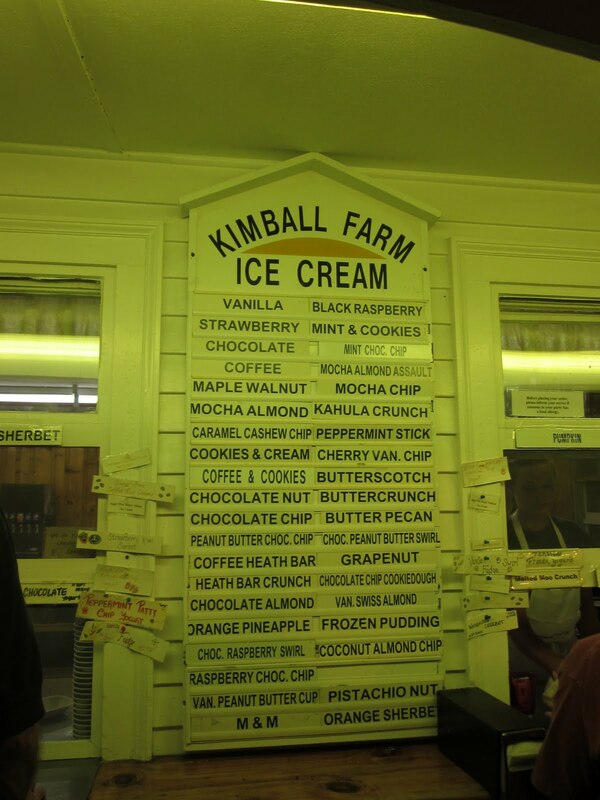 In that same post about ice cream places near Lexington, I wrote about Kimball's over in Carlisle. I went with my parents one night and tried their pumpkin ice cream. Delicious! As you can see, they have a regular menu, but then even more flavors stuck next to it with thumb tacks. It takes me forever to pick a flavor. Kimball's serves huge portions. Pictured below is my dad's kiddie size cone of frozen pudding. I'm hoping seeing his hand there will give you a good idea of the proportion. Maybe it's called "kiddie size" because it's the size of a small child's head. After a rainy bus ride from South Station, I made it back to Philadelphia last night. All in all, a fast but great trip to Boston! 30th Street Station - one of my favorite places in Philly! How have your summer travels been? Have you gotten to visit any favorite spots? This week I'm focusing my series on places that I miss in Ann Arbor to my favorite spots around campus. 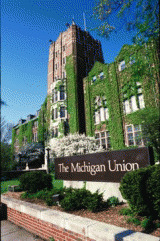 I visited the Michigan Union almost daily, and I always loved walking up to the grand, ivy-covered facade. My friends who visited from other schools often remarked, "That's your union?" It looks as gorgeous and as majestic as the Law Quad. On the front steps, JFK announced his idea for the Peace Corps in 1960, and the building is just as fantastic today as it was then. "...as a graduate of the Michigan of the East, Harvard University." That's right, Crimson. Michigan of the East. 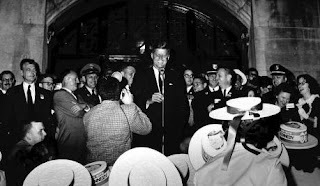 There are many parts of the Union that I love and miss: the Amer's, the phone booths with computers in them, the UAC office on the fourth floor, the circular couches outside the UAC office, the ballroom, and so on. One of my favorite spots in the Union, however, was the Union Tap Room. I think universities plant ivy on purpose to make their buildings look more intellectual. Separated from the underground area with the various fast food places, the Tap Room was one of my favorite places to study. I stopped in there a few times freshman year, and then from sophomore year onward I lived within two blocks of the Union, so the Tap Room became a close work spot where I would be less likely to fall asleep than if I studied on my couch. The Tap Room was a popular spots for my roommates, too, so during finals we would often camp out, take over an entire stretch of tables, and work like crazy until the Union staff kicked us out at 2 AM. We scouted certain tables based on the number of electrical outlets nearby for our laptops, and settled in to write our papers, study for our exams, and share youtube videos when we needed study breaks. With food and coffee conveniently in the same building, it was easy to stay for hours. It became relatively normal to run into one or more of my roommates at the Tap Room on any given night. We also frequently made plans to meet there and study. On one particular night in December of my junior year, one roommate and I were among very few Tap Room residents of the evening due to a massive snowstorm that had hit the state that day. Despite the inclement weather, we spent a good portion of our "study time" trying to convince another roommate to join us. I'm pretty sure our persuasion tactics revolved around texting the word "snooooooooow" over and over. During finals, somehow that seems like an effective strategy. By my senior year, I had expanded my studying to other locations, as detailed in my post about writing my thesis. However, the Tap Room remains one of my favorite campus spots, and one that I associate with productivity. Ignoring the youtube video sharing and texting, that is. Have you ever studied in the Tap Room? Where are your favorite study spots on campus? 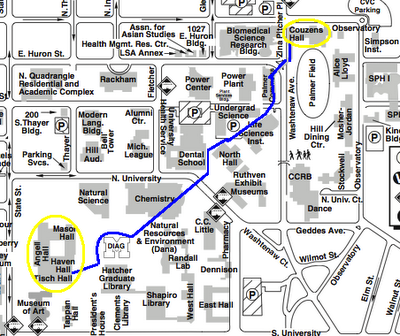 And if you're curious about what the Union looked like years ago, before Subway and Panda Express, here's a link to a website about it! 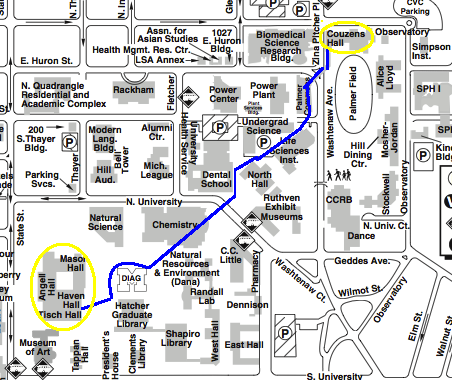 This week, I am going to share a few of my favorite places around campus at U of M! There is a view of campus that I have always loved. When you stand on the steps of the Graduate Library, you can see directly through the Diag to the area by the Bell Tower and the Rackham School of Graduate Studies. Ah, spring! The Michigan sky is no longer gray but the temperature is still pretty damn cold. You can see all the people traveling through the Diag and from the MLB and Michigan League. You can admire the beautiful architecture of Michigan's central campus. You can gaze at the open green space on the Diag as well as the frisbee players, musicians, and giant squirrels that may be occupying it. Over the trees, you can see Burton Memorial Tower silhouetted against the sky. My mom may or may not have taken this same picture on every single visit to Ann Arbor. The entire view from the grad library steps is a favorite area for me mostly because of its beauty. I often found myself walking between the Diag and the Bell Tower area and thinking, no matter how stressed or tired I was, that I was so happy to be at school in such a gorgeous place. 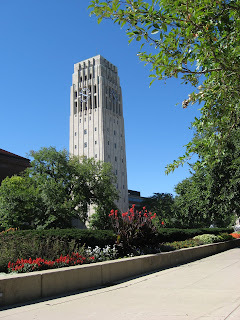 The buildings, especially the grandeur of the grad library, the Bell Tower, and Rackham, made the area inspiring for me. It was also always a comforting feeling. If I was worried about an exam or I felt overwhelmed by work, I was still happy to be where I was. Where are your favorite spots on campus? When I left for college, I found myself missing really strange places in my hometown. In addition to the usual spots - my house, the town center, the center playground - and the people, I missed specific locations, such as the intersection right next to my house and the traffic light in the middle of town. I couldn't explain why I missed these places so clearly, and I'm pretty sure my mom thought I was weird when I mentioned it. I've noticed the same thing happening since I left Ann Arbor. I miss the usual things - friends, our house, places around campus, favorite restaurants (oh Frita Batidos, I long for a caramel rum cream batido!) - but I also pine for intersections. I love the one near my street, right by the Ann Arbor District Library. I also miss all the corners on the walk down Liberty toward Main, past the post office, Cafe Japon, and a bunch of shops. I miss where Detroit Street cuts diagonally up towards Zingerman's. I love the corner between the Law Quad and Dominick's. I miss the corner of Main and Washington, where I'd turn left, cut through bd's Mongolian Barbeque's corner and walk down to Sweetwater's or Frita Batidos. A is for An Intersection I Miss. So why intersections? When I move to a new place, I've found that the best way for me to feel at home is to walk around the city or town. By walking, I see things that make the place special for me - stores I like, gardens that are especially pretty, houses with cool windows, or little hidden doors. Ann Arbor itself began feeling more like home once I got off campus and found my way around the city. It was also the first city where I lived on my own and started to feel like an independent adult (or as much of an adult as your average college kid can be). Though there were many things that made Ann Arbor feel like home to me, the various streets around where I lived were a major part. After two years on Hamilton Place, we finally got a street sign! 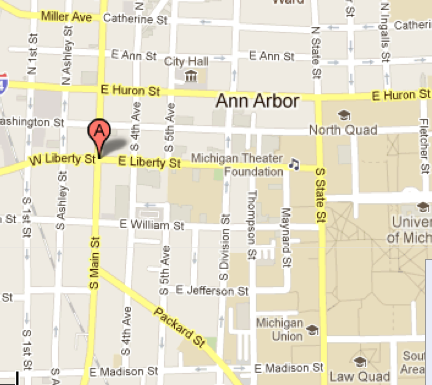 What are your favorite spots in Ann Arbor? Are there any specific streets you like best? Or do you like intersections, too?